I think this will make a good series, documenting this journey that I'm currently on. 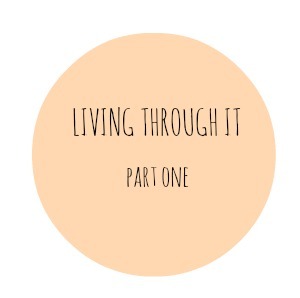 Living through it series is a fitting name because there simply is no other choice but to do just that. Sometimes the frustration overwhelms me and I cry. I don't cry for Frank. I do cry for Cooper but I cry for myself too. I was thinking tonight as Frank hopped in the back seat of my car to say hi to Cooper before he sped off back to his childless life, about the things that I missed, if any, of Frank being in our life. He was telling Cooper, "Daddy loves you. Daddy misses you. I'm going to see you tomorrow." I quickly decided that the only thing I miss so deeply that it bring physical pain is the look Cooper used to get when Frank walked through the front door from work. If you watched his eyes real closely you saw the flicker, "hey! i know this guy! my dad! i wonder where he's been!". It was accompanied by the biggest grin and a squeal on the best days. The first week Frank was officially gone he saw Cooper about four days. Each time we saw him Cooper got that same look on his face. As the next few weeks passed and we saw Frank less and less I began to wonder when the recognition would fade. We are a couple of month out now and it is blatantly obvious that Cooper no longer associates him with being "dad." Three hours in twenty five days just isn't enough to keep the bond present. As Frank told Cooper those things, "Daddy loves you. Daddy misses you. I'm going to see you tomorrow" I felt nauseous. How can those things be true? I hope Cooper learns the importance of words and actions as he grows. Through the different chapters of my life I've learned the importance of follow-through, of action, of saying only what you truly mean. I used to believe that Frank really did love Cooper and that he really would come tomorrow but now? I'm sure not sure. He never comes "tomorrow" like he says his will. Cooper is barely sleeping these days and as we end one day and round into the next I feel more and more like the single mom that I now am. When I feel like I can't possibly roll out of the bed one more time, because I already have thirteen times tonight to soothe a crying baby back to sleep, I have to force myself. It is only me. I am Coopers only caretaker. LOULOUMADE <----- My Etsy Shop! Right now I am willing you the strength to get through this. What you are doing will make you so strong and the bond between you and Cooper even stronger. This is not how it is supposed to be and it is not fair, but you will shine through this and come out on top. I cannot even imagine the pain that you are going through right now. Being a single parent is no easy job. I was the child of a single parent and know the hardships involved as I was watching my mom struggle with it everyday. I do believe that it's those type of experiences that can make us become stronger individuals and help us surrender our struggles to God. You will probably discover that you are stronger than you know, and that you have everything it takes and more to raise Cooper into a strong, successful and confident young man. Sending you lots of hugs.